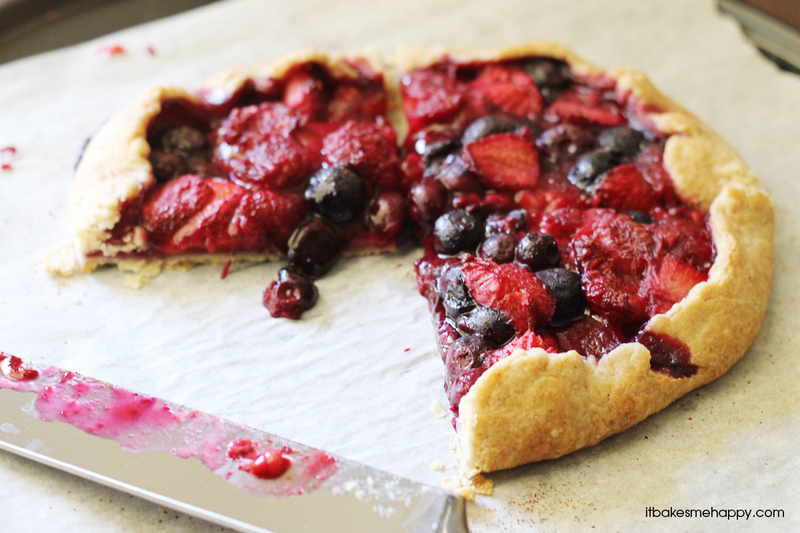 Whether you serve this for breakfast or dessert, your whole family is sure to love the fresh fruity flavors of this delicious Mixed Berry Galette. Last week one morning, I was feeling like something a little more than cereal for breakfast, so I raided my fridge and freezer. 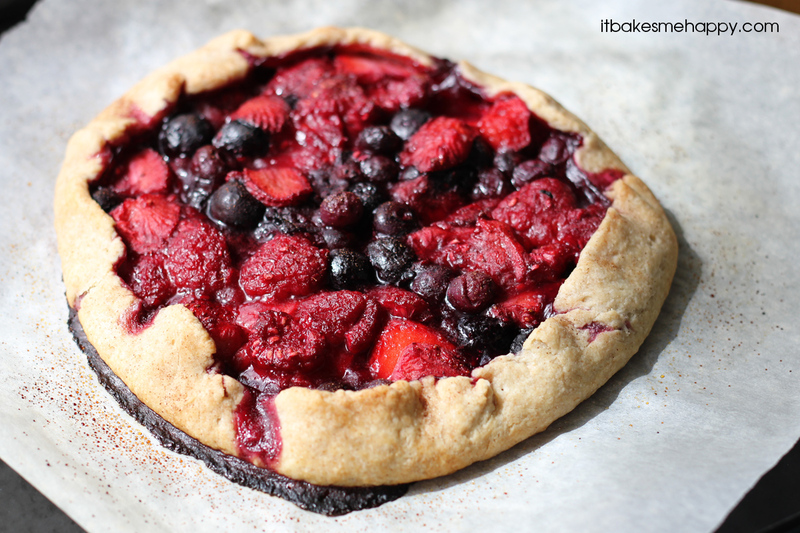 Luckily had a good selection of fruit, so I decided to make a mixed berry galette. Waiting for something to bake is always the hardest part for me when it comes to be in the kitchen, don’t you agree? This sweet little pastry is bursting with fresh fruity flavors and makes a great breakfast or dessert. I loved it so much I actually baked a second one over the weekend. I could eat the whole thing myself if I’m being honest with you, that’s how good this galette turned out. I hope you’ll enjoy – happy baking! Preheat your oven to 425º and line a baking pan with parchment, set aside. Slowly add the ice water and using a fork stir until the dough starts to come together. Place the dough in the fridge to chill while you mix the filling. In a small bowl add the berries, sugar, vanilla, corn starch and lemon juice and stir gently to combine. Roll the dough out into a circle about 1/4" thick and place in the lined pan. Spread the berry mixture over the middle of the dough and fold the edge of the dough up over the filling about 1/2". Cool on the pan for 10 minutes, slice and serve. It was, like I said I made two in just a few days! I’m trying to avoid chocolate for a while, this is a really tasty alternative! It’s one of those foods that is just the right amount of sweet and not too heavy, which makes it dangerously irresistible! This looks really good, but you know what I’d end up doing….picking out the crust!! 🙂 I know me well! Looks gorgeous! Love frut in dessert! We’ve recently launched the website RecipesUS.com. It’s a search engine that aims to gather all the best recipes from US websites and blogs in one place. We’ve noticed that you have a lot of great looking recipes on your blog that we would love to feature on our site. To read more about how it all works and to sign up with your blog, please visit: http://recipesus.com or send us an email on info@recipesus.com. We look forward to hearing from you! Love this, it looks amazing. I love a good berry pastry. Yum! I am gonna have to get some berries so I can try this. I love it when you post vegan recipes. I love the vibrant colours from the fruit. It looks delicious. I found your blog on Show and Share. That would be perfect for the 4th of July. It looks yummy. This looks absolutely amazing! I popped over from It’s Overflowing–thanks for sharing! Emily, this looks SO delicious! Thank you so much for sharing at our Best of the Weekend party and will be pinning to our party board! I plan to share this on FB over the weekend, too. Have a great weekend! Stopped over from the Best of the Weekend party and this recipe looks very delicious. Still waiting on Willy Wonka to patent and mass produce the food teleporter.